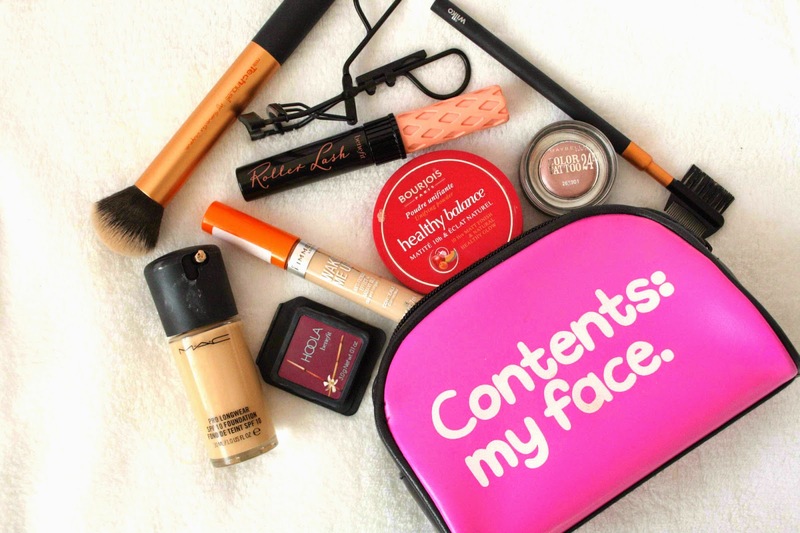 Personally I don’t store my makeup in a makeup bag, nor do I have a particularly exciting one; however since its coming up to summer, I’ll be going more places and so on, so I will be needed my makeup bag more often. These are some of my absolute essentials, as my makeup bag won’t suffice a whole massive makeup look! Hope you enjoy peeking into my makeup bag which by the way is from here. First up base. For foundation I chose to include my Mac Pro Longwear foundation in NC15. I love this foundation, its a great coverage and is pretty quick and easy to apply. Next up, concealer. My absolute cult favourite, Rimmel Wake Me Up concealer in Ivory. Another super quick and easy one, one of my favourite concealers, really brightening under the eyes and great for summer time too. Onto bronzer now. My tiny mini Hoola bronzer, aw. I LOVE this way to much, and I’m not sure why I haven’t purchased the full size yet. Super good for giving a nice bronzed summer look, with no orange undertones at all. To set stuff in place, powder. As seen on my blog recently, Bourjois Healthy Balance Powder. Super mattifying, fallen in love with this powder and will be using this throughout the summer time to keep my face nice and matte! Onto those eyes, now I don’t want anything thats going to take up masses of space in my makeup bag, so I like to take a singular eyeshadow. I picked one of my Maybelline Color Eye Tattoos. This is such a quick eye shadow to throw on and blend with a brush or your finger. A great staple item for your makeup bag. Then eye lash curlers, because where would I be without those?! Then finally my Benefit Roller Lash, I’m so inlove with this beauty, the most amazing mascara I’ve ever tried. So those are my essentials, I’ll be throwing in my makeup bag when I’m out and about this spring/summer!